The fish ladies hold a special place in the market's heart, where the floors are wet and kind of slimy, the pervasive smell of fish floats in the air, and the cold chill from the ice makes you forget the sunny day you left outside. Unless they're helping someone else, the fish ladies ("fish women" just doesn't fit) can be quite intimidating. 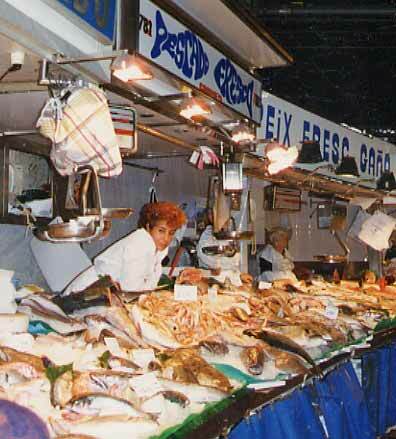 I've often wondered why fish ladies are so much more aggressive than say, the fruit sellers, or rabbit hawkers. Perhaps it is the urgency of their produce. If they don't sell it today, they'll smell it tomorrow. (Sorry.) You can see her leaning out, looking for possible victims, that is, clients. Look once in her direction and she'll be planning your supper. And it'll be delicious.